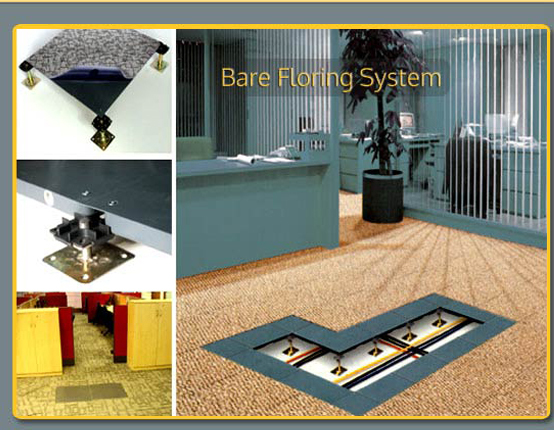 This system is the modern concept in the flooring for large high-tech open offices for managing different services (data, power & voice cables, fire pipes, under floor A/c systems, etc…). The system consists of steel cement tile, steel pedestals & PVC cap. Panels are made out of cold-roll steel sheets which are punched; spot welded & epoxy powder coating. Inside of panel is filled with formed cement. Holes are made at four corners for locking the tile to the pedestal with screws from top. Anti-vibration caps are placed between the pedestal top tile for walking comfort & low noise. This system can be directly installed on the RCC slabs in new building with the minimum height as low as 100mm to save the space & accommodate all services. 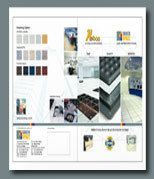 Floor covering can be done by carpet or PVC tile. This product is suitable for large open offices.